Good groupie taken by Martin on the first days lunch stop, Laughing Planet in Reno. 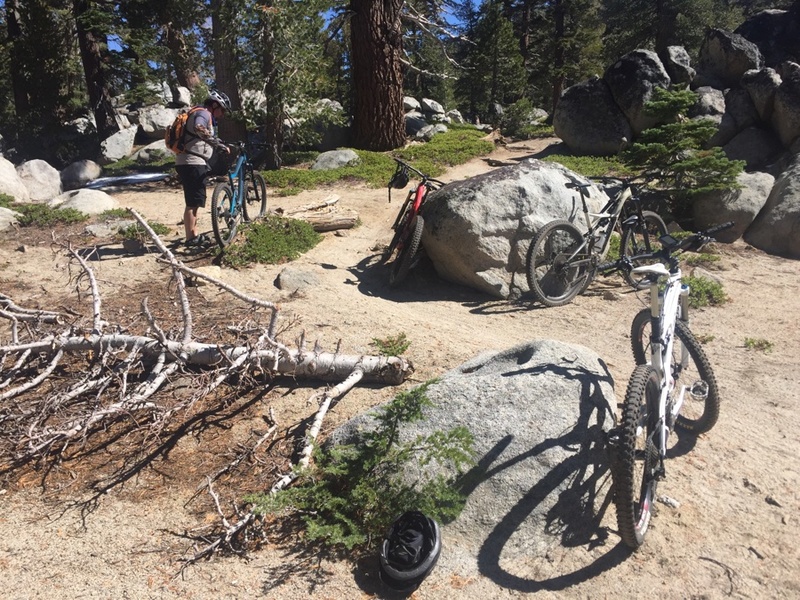 It was Tuesday and we wanted to ride a favorite down in South Lake Tahoe called Armstrong. 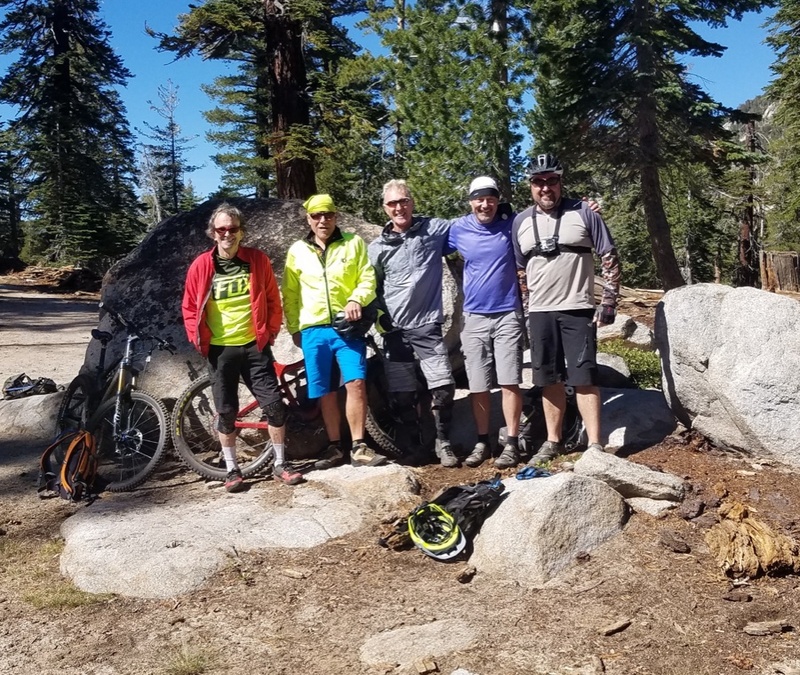 When we first rode it we accessed it from the north and had to gain 3,000′ via Cold Creek to Star Lake and the saddle next to Freel Peak up at a rarefied 9,500′. Next we tried to get a shuttle up the backside of Armstrong’s but the commercial guys did not want to drive the 6 mile dirt road up Willow creek. 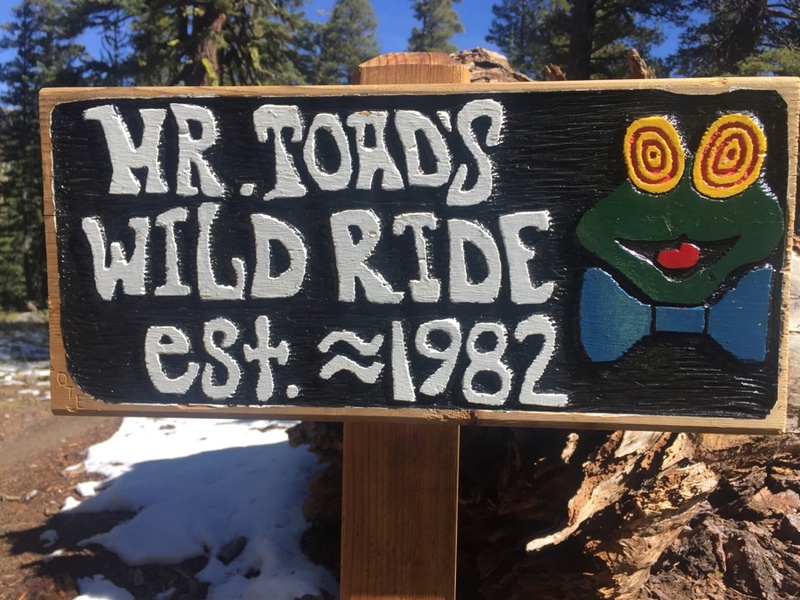 OK, how about riding up the approach to Mr Toads and then taking the connector over to the start of Armstrong’s? Still had to climb from 7,200′ up to the start at around 8,800′ with some ups and downs along the way. First break near the start of Mr Toads ride. Known for a massive rock garden near the start but otherwise a great ride. Armstrong Pass where me met other riders and had our group photo taken. 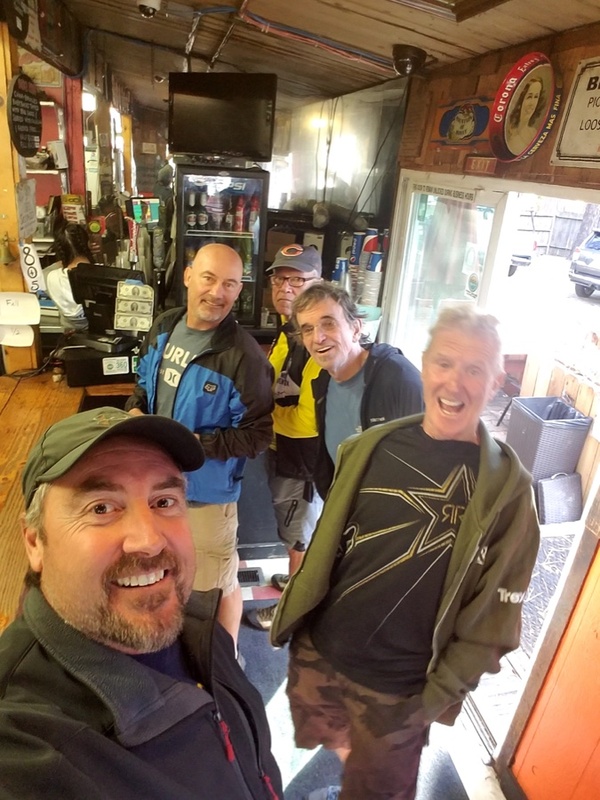 L to R Jud, Andre, Gordon, Gary & Martin. “Armstrong’s” is an 8 mile downhill collage; Armstrong itself, the Connector, Sidewinder with it’s infinite banked curves that will make you dizzy and a finish down Corral’s table top jumps. 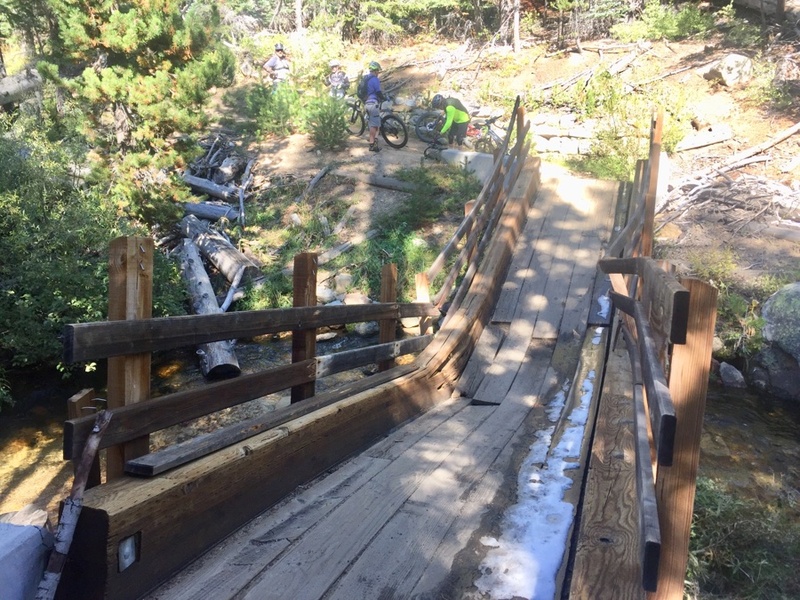 Damaged bridge at the bottom of Armstrong’s itself. Last riding day – Let’s do something not too hard. 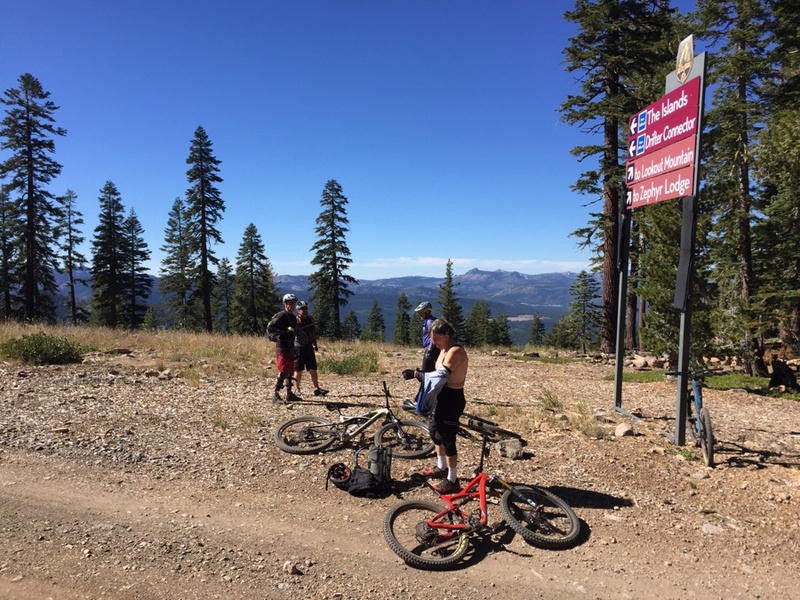 Hwy 267 out of Truckee has Northstar resort to the west and Martis Peak to the east where there is a road up to a fire lookout. Thing is that many of the user created trails are on private property and there were new signs alongside the road where we wanted to ride. Rebel Jud persuades us it will be fine and we take off down “Dirty Harry” which quickly become obliterated by bulldozer treads. Naturally we get off trail & lost as we follow a red herring up into the snow. 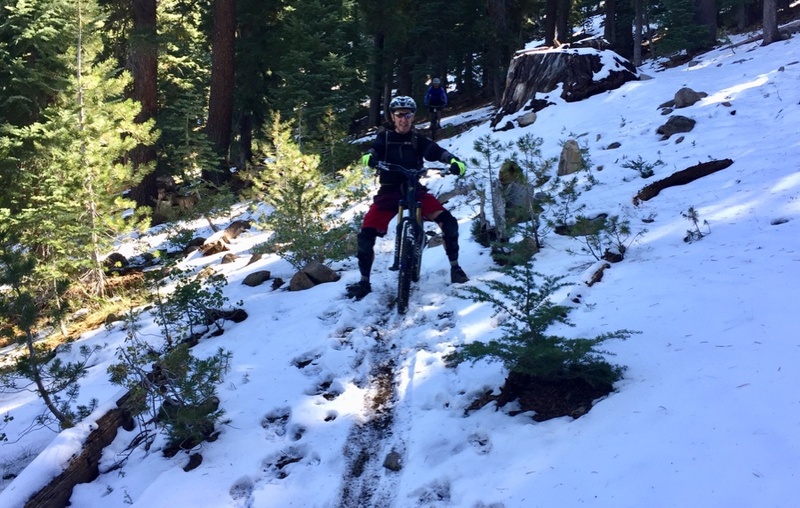 Yes, there was snow on the trail. Gordon playing in the snow. 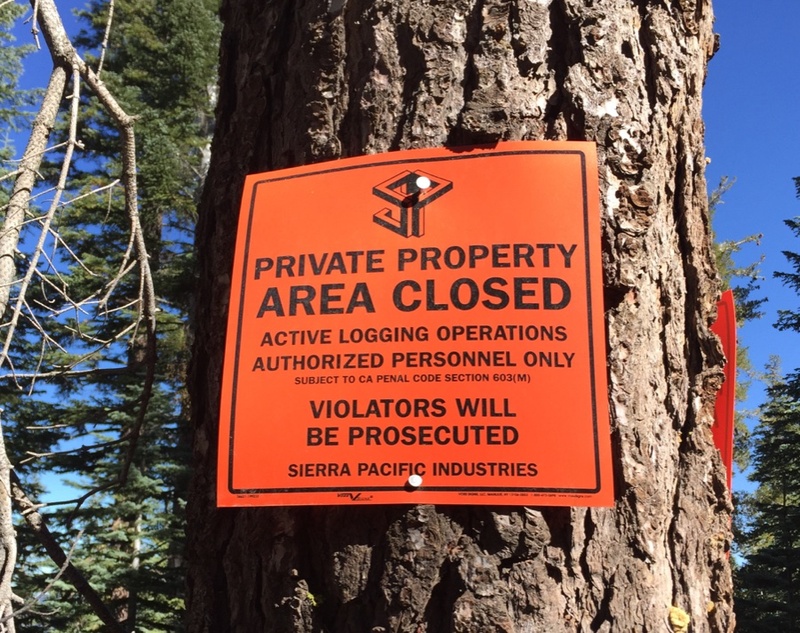 We find where the trail picks up again but down at the first logging road we hear sounds of heavy machinery and chain saws going nuts. We bailout to the Martis Peak road we had come in on to avoid confrontation although Jud was quite happy to play cat & mouse with the loggers. Now what? 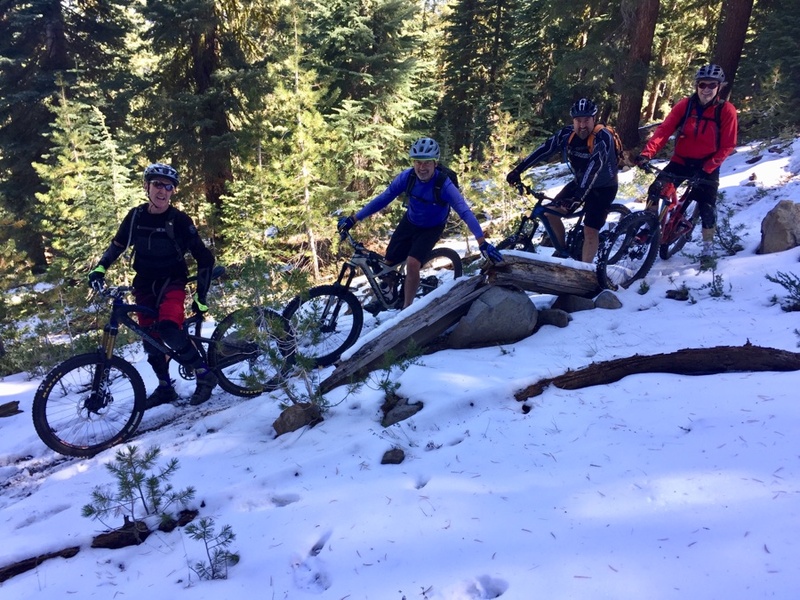 Pick up the TRT down to Hwy 267 which we cross and keep on the single track as we climb the backside of Northstar with the hopes of accessing their downhill runs. No lifts are running and we are renting one of their houses so we are quite content to see what there is to offer. A bit of mucking around brings us to Livewire, a black diamond that heads down to the lodge. I take off last and enjoy the ride as long there is not a crazy rider on my arse pushing me to go faster. 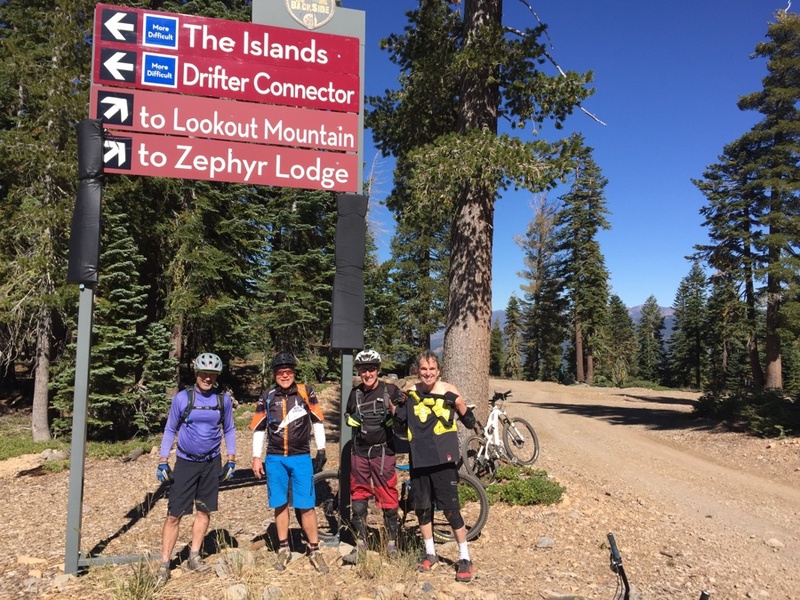 Tahoe is great and there is always fun to be had. Great boys week as I head for home to pack the RV for a October run up to SW Utah before winter sets in. Nice! You and the boys did good! Next Next post: Busting out of LA gets more challenging.